Here's another super long post filled with photos of an event I attended last night! I first got to know about the international photographer Langston Hues from Detroit last year on Instagram and was impressed with his skills photographing modest street looks of fashionistas all over the world. I once commented on his IG account and he replied back on my latest photo on IG saying that he will be coming to Malaysia in 2014. I remember excitedly telling my husband this. I then started to stalk his website Modest Street Fashion and registered myself on his newsletter. Earlier this month, 2nd February 2014, the sweet Natasha Hudson invited me and a few other girls to be part of the photoshoot by Langston during his short stay in Malaysia after coming to Singapore and Jakarta. I was really excited to be invited and instantly agreed to be a part of it. Then, Natasha invited us to the Meet & Greet event organised by ArtBeat Consultants and Crescent Collective at Talent Lounge PJ Trade Arts Centre featuring herself Mizz Nina and Felicia Yeap. 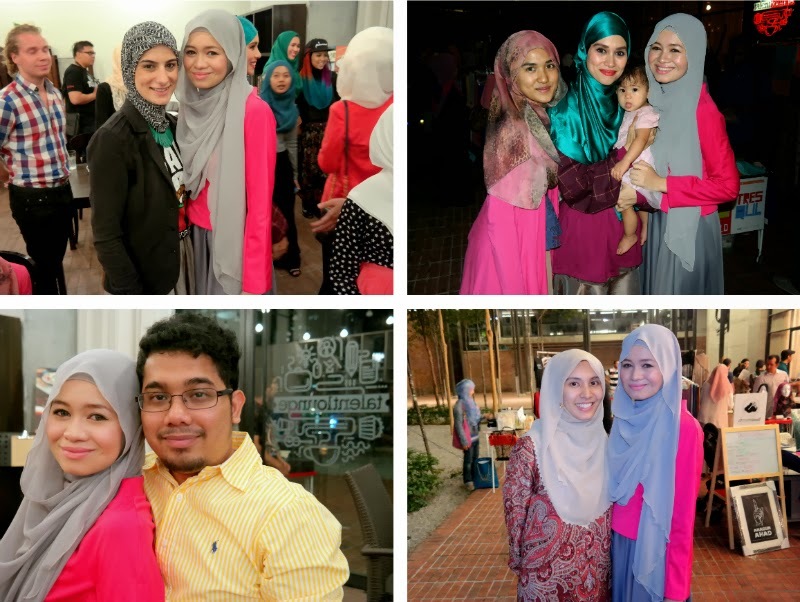 So I attended the event together with my siter-in-law Syahira Zakaria and my husband last night. Coincidentally both me and my SIL wore hot pink tops! Sisterly instincts! None of us wanted to change as we were already late and rushing to go to the event. We were lost and went to another building instead. Because of the beautiful interior, we decided to snap a few pictures there before we made our way to the correct venue. Hehehe. The beautiful Natasha Hudson who could pull off anything she wears! Always a comfort and a pleasure whenever I get to meet her. 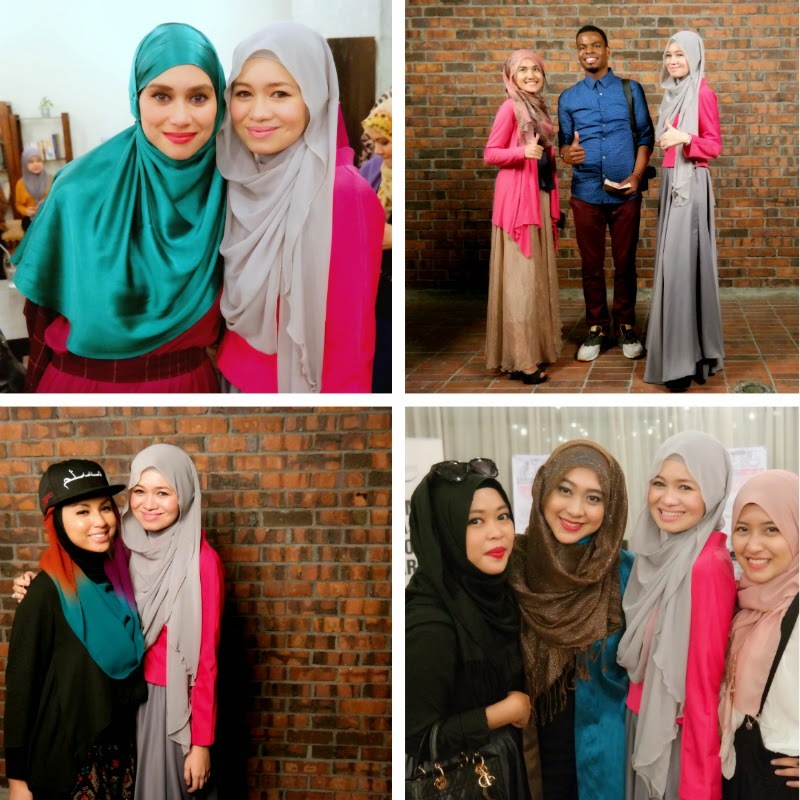 The last time I met Mizz Nina was at a friend's daughter's aqiqah (Ervinna's little Zahra) and it is so lovely to see her transformation after she came back from Hajj. Really beautiful to see. Alhamdulillah. From left to right, Mia who called me up for the photoshoot, Iman Salam who cried when she saw me, the cute and sweet Sha Elaiza the host of the event and Najat Nordin whom I followed on IG coz of her awesome hijab style I spotted. Sya and I with the talented yet humble Mr Langston Hues. The husband took this photo of us of course, and all the other photos in this post with me in it! Haha. Atiyah captured this candid moment of me and my husband, my personal photographer. I couldn't imagine going to the event without him last night. It was so overwhelming in so many ways. Unexplainable but blessed to have him accompany me and Sya. With the bubbly Jezmine Blossom :) Love the candid shots eventhough its a little blurry. Miss Shea Rasol, another lady I really love to bump into! Don't forget our date! The Nurul Izzah. Gosh time really flies. I think the last time I actually met her was when I was 17, some 13 years ago. We actually met up quite a lot during those days. It was good to get to chat a lot with her yesterday. In those 13 years so many things has happened. Now, she's a politician and a mother of 2! Time really flies but she doesn't look like she has aged at all and still the same funny and concerned person she was back then. Lyna Kamal & Farah Khairuddin had to leave so early but we managed to snap this picture! Lookshots I took of Atiyah, Sya and Dayah. Mine was taken by the husband. I wore Belle Grey from ARNADIA by @gayacollective. Outfit details soon ya? Modesty is subjective. What is modest to one person might not be modest to another. Vice versa. But I don't think I'm going to start to talk about that here. I am happy that Langston came with this idea to shoot street fashion shots of people around the world. Something like the Sartorialist but for modest fashion. It is a really great effort. Fashion connects people in a lot of ways and I think this project is a clear example of that. The event last night was nice. Eventhough I didn't get to really chat properly with Langston as he was busy being the superstar of the night, I managed to meet friends and fashion lovers whom I haven't met for awhile and also had the chance to meet new ones. Do support the Modest Street Fashion movement and follow him on his Instagram for updates @langstonhues guys! oh, wow. this is crazy. najat and i went to secondary school together. small world, and getting smaller!